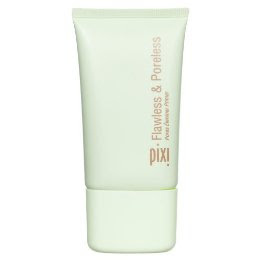 You might not think your local target would be the destination to find your next makeup primer - but thanks to the great makeup line line, Pixi, now it is! It made a real difference in the finish of my skin - a nice dewy, hydrated look, but definately with less visable oil during the day in my T-zone. My makeup applied easily and smoothly, and it also served as a great moisturizer on it's own. Concealer, powder foundation and even my cheek and eye makeup stayed on longer, with the colors just as vivid as in the morning as when I applied them in the morning. I also love the pretty, soft green squeeze tube with nozzle applicator. *The product was provided courtesy of Pixi PR for reviewing purposes.